NASA astronauts Scott Kelly (left) and Kjell Lindgren recently participated, from orbit, in a Q&A with the cast and director of the upcoming sci-fi film "The Martian." Lindgren explained that, after being accepted as a NASA astronaut candidate, he trained for about 2.5 years to acquire basic space flying skills and knowledge. Then, he trained for another 2.5 years after being assigned to the current mission, learning, among other things, the Russian language, space-station systems and spacewalking procedures. "So, in all, to get up here where I am today, there was about a five-year training flow," Lindgren said. Scott inquired if the cramped quarters aboard the ISS ever result in "punch-ups" between astronauts. "I've never encountered that kind of thing," Kelly responded. "NASA and their international partners do a pretty good job in vetting the people that they send up here, and we're all pretty, I think, easy to get along with, especially in this environment." But, Kelly added, "those things do happen; I've heard stories of them happening, but I've never experienced it personally." Kelly arrived at the space station in March, and Lindgren got up there in July. 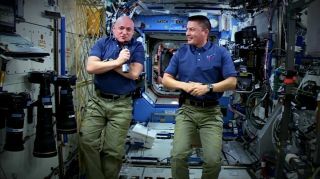 Kelly and cosmonaut Mikhail Kornienko are in the middle of an unprecedented yearlong mission that's designed to see how long-duration missions to faraway destinations such as Mars would affect astronauts physiologically and psychologically. Lindgren, on the other hand, is aboard for the typical six-month stint. There are three other crewmembers currently aboard the orbiting lab, in addition to Kelly, Kornienko and Lindgren: Japan's Kimiya Yui and cosmonauts Sergey Volkov and Oleg Kononenko. Kelly explained that the pilot was responsible for maintenance of the shuttle's toilet. "The reason they had the pilot do that is, it's such a critical task — because without a toilet, you're not going anywhere," Kelly said, smiling. "So they will only entrust that to the most talented and capable person on a spacecraft." "The Martian," which is based on the novel of the same name by Andy Weir, hits theaters across the United States this Friday (Oct. 2). NASA officials and researchers served as advisers for the film, and the space agency is promoting "The Martian" as a way to help spread the word about its own plans to put boots on the Red Planet in the 2030s.